I have inherited a fairly large SQL Server database. It seems to take up more space than I would expect, given the data it contains. Is there an easy way to determine how much space on disk each table is consuming? If you are using SQL Server Management Studio (SSMS), instead of running a query (which in my case returned duplicate rows) you can run a standard report. sp_spaceused can get you information on the disk space used by a table, indexed view, or the whole database. This reports the disk usage information for the ContactInfo table. You can also get disk usage from within the right-click Standard Reports functionality of SQL Server. To get to this report, navigate from the server object in Object Explorer, move down to the Databases object, and then right-click any database. From the menu that appears, select Reports, then Standard Reports, and then "Disk Usage by Partition: [DatabaseName]". After some searching, I could not find an easy way to get information on all of the tables. There is a handy stored procedure named sp_spaceused that will return all of the space used by the database. If provided with a table name, it returns the space used by that table. However, the results returned by the stored procedure are not sortable, since the columns are character values. The following script will generate the information I'm looking for. 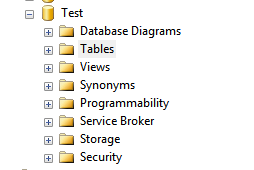 Then open the Object Explorer Details (either by pressing F7 or going to View->Object Explorer Details). In the object explorer details page, right click on the column header and enable the columns that you would like to see in the page. You can sort the data by any column too. We use table partitioning and had some trouble with the queries provided above due to duplicate records. For those who need this, you can find below the query as run by SQL Server 2014 when generating the "Disk usage by table" report. I assume it also works with previous versions of SQL Server. --p.rows DESC --Uncomment to order by amount rows instead of size in KB. This will give you the sizes, and record counts for each table. And you can change it to insert all of result into temp table and after that select from temp table. In SQL query analyzer, select from top tool bar option Results to file (Ctrl + Shift + F). Now finally hit the Execute button red marked from the above tool bar. The Database size of all tables is now stored in a file on your computer. My post is only relevant for SQL Server 2000 and has been tested to work in my environment. This code accesses All possible databases of a single instance, not just a single database. I use two temp tables to help collect the appropriate data and then dump the results into one 'Live' table. Returned data is: DatabaseName, DatabaseTableName, Rows (in the Table), data (size of the table in KB it would seem), entry data (I find this useful for knowing when I last ran the script). Downfall to this code is the 'data' field is not stored as an int (The chars 'KB' are kept in that field), and that would be useful (but not totally necessary) for sorting. Hopefully this code helps someone out there and saves them some time! -- but in my case a near enough approach has been good enough. How to find the size of a table in SQL? How can you tell what Tables are taking up the most space in a SQL Server 2005 Database? How to Get all table space name, Allocated size, Free size, Capacity from single query? How many users can a 200mb ASP.NET membership database hold? How much space does an empty table use in Microsoft SQL Server 2008 R2? When should I use a table variable vs temporary table in sql server?